University of Sydney precision weed control scientist, Guy Coleman, with the weed detection robot under test at the Plant Breeding Institute, Narrabri, NSW. 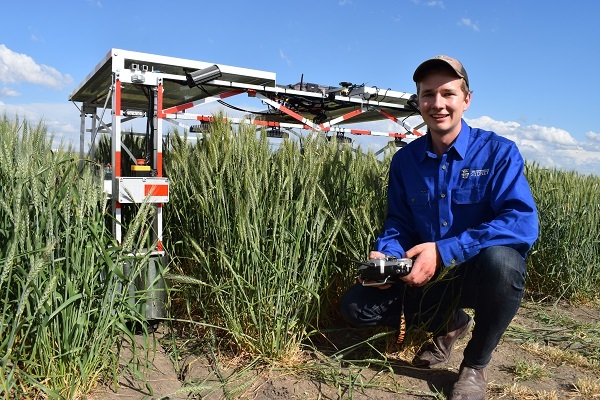 WEED detection and identification is moving into the robotic age at the University of Sydney’s Plant Breeding Institute at Narrabri in north west New South Wales where a high-tech research project is fine-tuning the technology. University of Sydney precision weed control scientist, Guy Coleman, has designed an autonomous weed recognition and control robot that is currently being tested in research and trial plot work, but might ultimately have application in broadacre agriculture. The machine features off-the-shelf sensors and imagery equipment set up to target and identify weeds. “It can produce a normal image, but one which has depth, so it can produce a 3D model of the surroundings quite cheaply,” Mr Coleman said. “It projects an infrared grid onto the environment, has an infrared camera that picks up the distortions, and has a static camera that assigns red/green/blue pixel values to each of the pixels. Mr Coleman said the challenge was to develop weed detection and identification technology with the accuracy and capability equivalent to sophisticated face recognition technology. “Face recognition already accesses data sets that are open sourced with three million data sets behind them. It has ways of recognising your face. If we can be at that level with weed recognition, it will be a much brighter future in terms of weed control. That is what we are hoping to achieve,” he said. However, he said the robotic work at Narrabri was still at the stage where the machine was being “trained” in weed recognition through a multitude of images and data sets. “The challenge is identifying weeds that look similar. We need to be able to identify which ones are wild radish or turnip weed, for instance. The Holy Grail is identifying ryegrass and wild oats in wheat at the early stage. That is the pinnacle,” he said. Mr Coleman said he saw a time in the future when the robot platform could be used on farms for post-emergent weed control. “We would let the herbicides do the work early in the season with a selective pre-emergent, then come in with a robot like this to identify the weeds late in the season which might have escaped the herbicide application because of resistance, and kill them that way,” he said. Mr Coleman said another reason for designing the machine was to create a less labour-intensive way of assessing and phenotyping plants in trial plots on the research station. “At the moment there are 40,000 plots here at Narrabri and most of those are assessed by hand. If you can make that autonomous, researchers at their desks can just click a button and the robot will go out and detect height, growth stages, DVI, etc.,” he said.